The 9 to 5 workday is a product of nineteenth-century socialism. 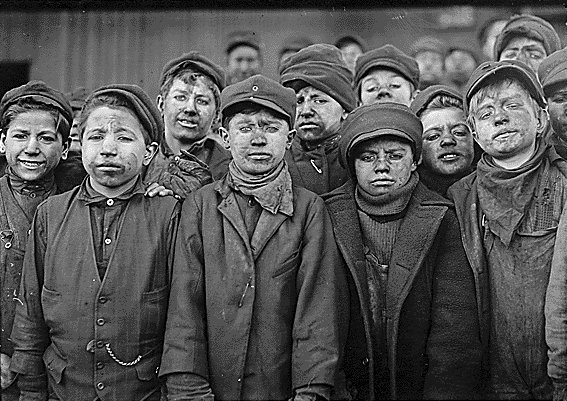 Back when there was no upper limit to the hours that organisations could demand of factory workers when the industrial revolution saw children as young as six years old working the coal mines and 100 hour work weeks were the norm, the American labor unions fought hard to instill a 5-day work week and 8-hour work day. As is still the case today, Government — or in this case the United States Congress — lagged behind industry, ratifying the Fair Labor Standards Act in 1938, a decade after industrial behemoths such as Ford had already mandated forty hour weeks. It was arguably a much simpler time as far as the means of production was concerned. While white collar work and creative industries did exist, they were the domain of the elite few as opposed to the domain of the many. The masses were employed by industry to execute on simple algorithmic tasks, on the factory floor, where one’s level of output was almost always conflated with their hours worked. Since the first industrial revolution of the 1800s gave us machines, chemical manufacturing, iron production, steam power, and the factory system, we’ve lived through two more industrial revolutions. Today’s third industrial revolution has given us computers, the internet and new sources of energy, all helping to reduce the cost of producing and distributing goods and services virtually to zero. While the services industry and manufacturing are not dead yet, human beings are, in great numbers, transitioning to jobs that require us to move beyond the mindless execution of procedure towards jobs that require critical thinking, problem-solving, creativity, collaboration, and people management, particularly in the west. Hours worked is not directly conflated with, nor is it a good indicator of output when it comes to such work. 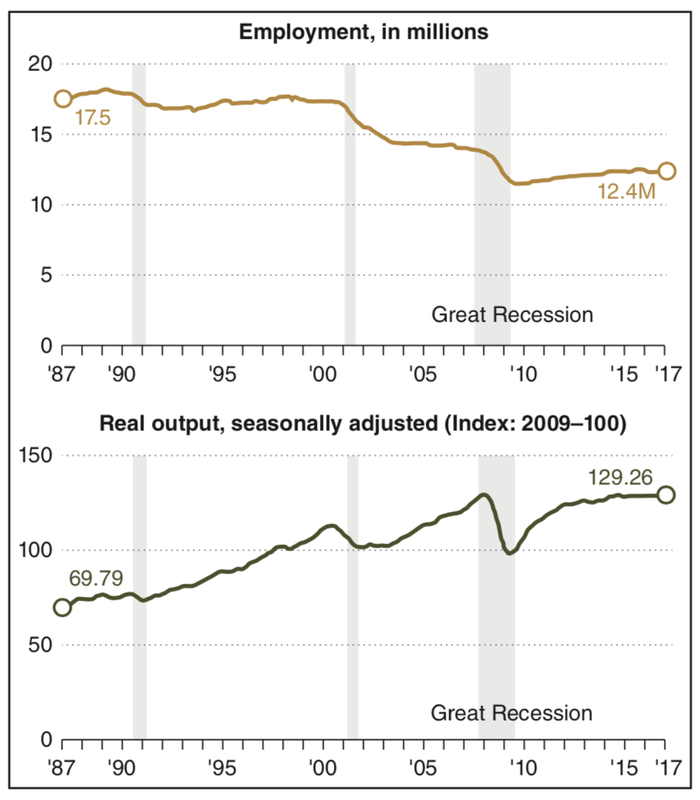 This is reflected in US Labor Statistics which demonstrate that since the turn of the Century, manufacturing output has increased whilst manufacturing employment has decreased (see below), while in Australia, manufacturing jobs dropped 24 percent in the five years to 2016 alone. Additionally, over the past ten to fifteen years we’ve seen the emergence of affordable digital technologies that empower us to do much more with much less. For example, Blockbuster Video’s bricks and mortar business was worth US$5 billion at its peak, and it had to employ 60,000 people worldwide to achieve this feat. Today, Netflix’s digital business is worth over US$170 billion and has little more than 5,500 employees. That’s 34 times the value with one-twelfth the workforce — the power of exponentially growing digital technologies at work. Yet, despite this transition from algorithmic to heuristic work, despite having access to technologies that empower us to work and collaborate from anywhere, at any time, and automate much of what we previously did (including diagnosing diseases and painting Rembrandts), the 9 to 5 workday still reigns supreme. Not only that, but in many organisations and professions, people are expected to be physically present long after 5pm, regardless of whether or not they are actually being productive or have any cognitive channel capacity left. In a recent Linkedin post by Adam Grant, Wharton Professor and bestselling author of books such as Originals, the case was made for transitioning to a 6-hour workday and calling time at 3pm. His reasoning for this was that productivity is more about attention management and less about time management. The modern psychology and neuroscience literature seems to agree. 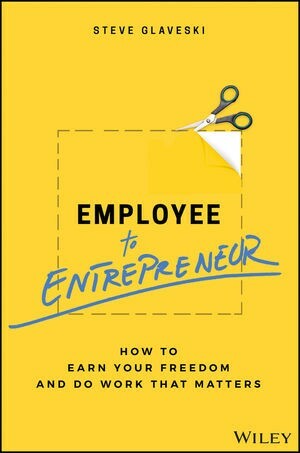 Star Wharton professor Adam Grant’s view on the 9 to 5 workday. Flow has been defined as a mental state of operation in which a person performing an activity is fully immersed in a feeling of energised focus — think surfing or writing an article. First coined by Hungarian-American psychologist Mihaly Csikszentmihalyi in 1975, you might yourself have referred to flow as being “in the zone”. What is less widely understood is that it is, in fact, a physiological state. A 10-year McKinsey study on flow and productivity found that top executives are 500 percent more productive when in flow — 500 percent! 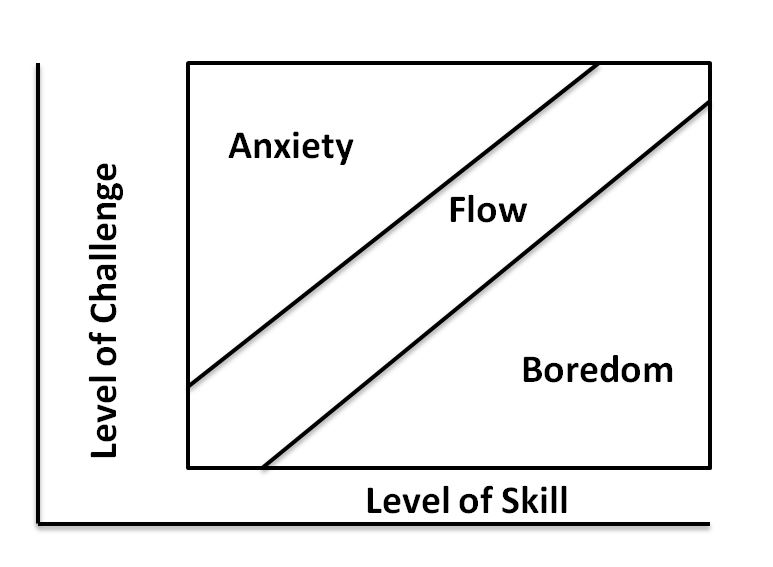 There are a number of psychological, environmental and social triggers that help people to get into flow such as an intense focus on a single task where the challenge to skill ratio is just right (neither getting bored by ease nor disgruntled by difficulty). Author Cal Newport echoed these sentiments in his bestselling book, Deep Work, a term that is synonymous with flow. He says that “in order to produce at an elite level, one must get into flow”. Carby lunches that leave us feeling flat and utterly useless during the afternoon. But here’s the thing, even if you have the ‘perfect environment’, one that is geared towards your people getting into flow, you can only really operate at this intense level for several hours a day. Cal Newport says that “three to four hours of continuous, undisturbed deep work each day is all that it takes to see a transformational change in our productivity and our lives”. Sherry Walling, author, host of the Zen Founder podcast and clinical psychologist, echoed these sentiments on my podcast, putting the upper limits of flow at “about five hours”. I’ve felt this many times, especially when writing, or doing some manner of work that requires me to be completely and uncompromisingly creative and/or focused. While writing my forthcoming Wiley book, Employee to Entrepreneur, I took some time out and spent a week in Bangkok to work on the manuscript. Each day, I’d wrap up an early morning work-out and make my way to a local cafe for some an 8am start, powered by some black Thai coffee. I’d do away with all distractions, turn off all notifications, put my phone away and instead of listening to music, I’d listen to binaural beats (check out Brain.FM) to help me get into flow. Once there, I was focused, and managed to churn out 5,000 words most mornings. But by 11am, I was proverbially cooked. I’d head out for a wonder, maybe sneak in a cheeky Thai beef salad, and by the early afternoon, I was back at it. Only this time, I usually managed another 2,000 to 3,000 words and by 3pm or 4pm, I was more or less done for the day. I could persevere but by this point, any subsequent efforts would have been mostly in vain, generating a much lower quantity and quality of words per minute for my time. I opted instead to spend the rest of the day exploring temples and museums, exploring the city by bicycle and partaking in Muay Thai classes. With this in mind, I decided to challenge the 9 to 5 work day at Collective Campus and run an experiment; the 9 to 3 workday. For context’s sake, we’re a corporate innovation accelerator (which means we train, consult and run startup accelerator programs for big corporates wanting to become more innovative). We’ve been around since early 2015, generate seven figures, have a core team of eight employees with an extended team of about 20 contract-based facilitators, consultants, assistants, designers and developers. We’ve worked with over 50 big brands globally (including the likes of BNP Paribas, National Australia Bank, Clifford Chance, Microsoft and Village Roadshow) and have incubated over 100 startups that have collectively raised over US$20M. During this time, I managed to self-publish two books and subsequently scored a book deal with global publishing house Wiley, and I launched a podcast which is now almost 300 episodes strong. As a team, we launched Lemonade Stand (a children’s entrepreneurship program that’s been rolled out to over 1,000 kids) and Konkrete, a distributed share registry on the blockchain, which we’re currently raising capital for. In terms of output, we’re no slouches. This output has been made possible because we’ve leveraged many tools and tactics to optimise our output, some of which I touched on earlier. Interestingly, on 80/20, when I announced that we were embarking upon this experiment on LinkedIn, the founder of a company fired back with the following. One founder’s opinion on the 9 to 3 workday. That there is absolutely nothing else to do nor benefit to derive by calling it a day at 3pm (no consideration for opportunity cost). Since our inception as a company, despite offering the team the opportunity to work remotely, we’ve more or less found ourselves working what has amounted to an 8:30am to 6:30pm work day, give or take, despite often feeling that afternoon slump at around 3:30pm. So it was time to run an experiment. Doing things because “that’s the way they’ve always been done around here” or because “that’s what everybody else does” is rarely a good reason to do things, especially not when you run an innovation accelerator! Given how much our world has changed since the Fair Labor Standards Act came into effect, it makes sense to experiment with different styles of work. Peter Drucker said that if you can measure it you can manage it. It’s not enough to run the experiment and simply use people’s opinions and your own observations after the fact as to whether or not people were productive. First, define what you want to measure. We didn’t only want to measure productivity, but employee wellness, energy and morale. 2. Define how you’ll measure it. Use smart metrics that you can compare to previous periods. As an aside, watch out for false positives and false negatives. This was not a completely isolated scientific experiment by any stretch of the imagination. For example, I had just returned from a week away so my general energy and wellness numbers may have been impacted accordingly. Similarly, one of my colleagues is on the fund-raising trail, which means an uphill slog and can sometimes mean hearing “no” nine times for every single “yes”, and people saying one thing but doing another, which ultimately could have adversely impacted his energy and wellness numbers — something he admitted to. Certain types of roles are more measurable than others. Performance in a sales role is easier to quantify. You might use standard metrics such as leads generated, qualified leads, outbound emails, phone calls, meetings, proposals sent, deals done and so on. However, for roles where productivity is not as easily quantifiable, one can borrow from the world of agile project management and apply story points (a method of estimating effort required to complete a task). For example, our designer/digital marketer used story points to determine, based on a quick review of tasks she had performed in the past three months in our project management tool Asana, roughly how many story points she completes per day and week. She used this as her baseline to help compare and determine whether a shorter workday, with more intense focus, impacted her productivity. Ensure that people monitor their metrics on a daily basis. In our case, it was a matter of tracking numbers and answering questions at the end of each day and the start of each day (we’ll get to that shortly). How did I feel at end of the day / could I give more? How much more? How did I feel at start of the day? Was I full of energy? Motivated? How did I feel during the day? 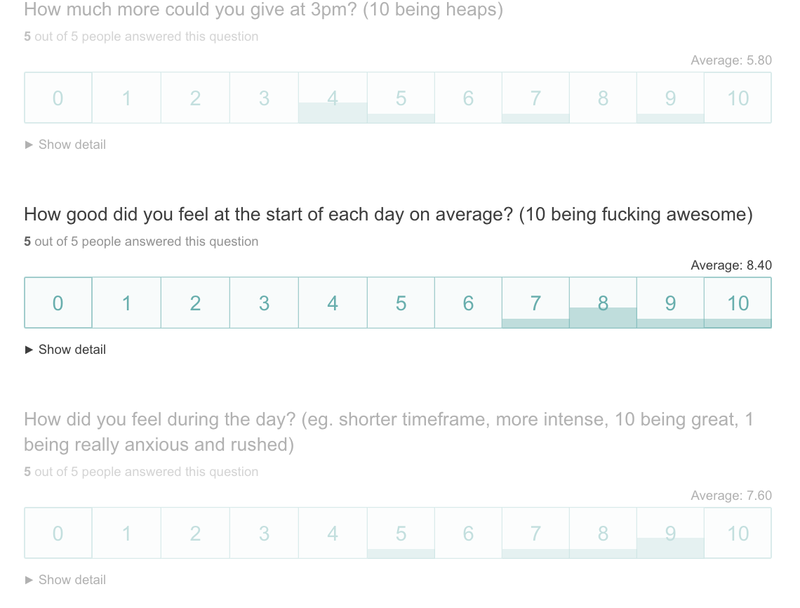 Was I more focused and productive, more effective? Was the intensity too much / did it create anxiety? Did I feel rushed? Did you feel like you were moving the needle towards or compromising our goals? Did I feel comfortable doing this? Were you waiting for others to leave first? What else would you like to experiment with? What might your ideal be? Do you feel like you’re falling behind your workload and have to make it up somewhere? 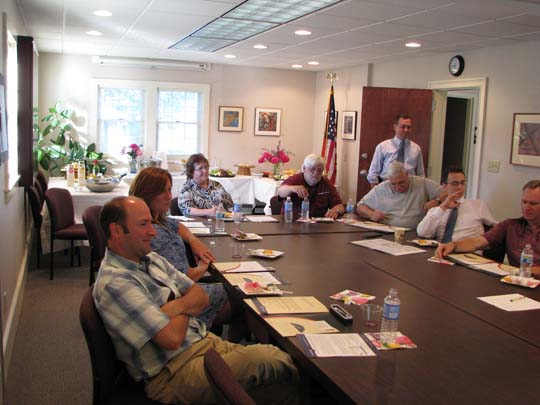 I took the time to review the statistics pertaining to people’s individual objective performance metrics. It’s pointless running the experiment if you don’t check in on the numbers. Our team met for a short 30-minute meeting to review the results of the survey, the performance statistics and also to engage in a discussion about people’s experience; what they liked about it, what they didn’t like, what could be better, what some of the challenges might have been on so on. This works well if you have a culture of transparency where people at all levels are not afraid to speak their minds. The entire team seemed to enjoy the experiment, and said that despite some teething issues, they got as much done, deliberately spent more time in flow — which is a rewarding place to be — and felt much better and fresher in the morning. They also had more time to explore other pursuits such as dancing, yoga and being a father to a six-month-old. Find below a snapshot of the survey results. You can access the rest of the survey results here. The team’s statistics showed no noticeable negative effect on output. For example, find statistics below for my colleague Charity, the designer/marketer I introduced earlier. She had no issues hitting the 50 story points that she had maintained as a daily average before diving into the experiment. My colleague Shay, who spends most of his time on business development, managed to generate more leads during the experiment than an average week with a flow-on effect on new opportunities created, proposals sent and sales closed. Ultimately, we all performed just as well as we had been, on average, for the three months leading up to the experiment, only we felt much better doing it. An afternoon break works wonders; one day, I worked from 9am through to 3pm, and made my way to the gym for a late-afternoon workout. This shot of energy inspired me to return to my laptop to crank out another two hours of what was way more productive, deep work between 5pm and 7pm than if I had just pushed through to 5pm. This has given birth to another experiment we’ll run in the near future, that of the broken up work-day (more on that later). Deciding whether or not you should call it a day at 3pm is contigent on three things; cognitive capacity, outcomes delivered and urgency. If, for whatever reason, you haven’t spent more than an hour in flow on that day, then chances are, you’ve still got more to give. Give it. To do otherwise would be shortchanging your team and objectives. You might be at capacity, but are working towards an urgent deadline the next day. In that case, it makes sense to go for a walk, go for a workout, meet a friend for a social coffee, but return to it by 4 or 5pm so that you can hit those goals. It’s about not losing sight of the outcome and objectives of the organisation. Ultimately, this is all about a transition to an outcome-focused workplace. So always rememeber, C (cognitive capacity), O (outcome delivery) and U (urgency), when deciding whether you should call it a day. This experiment lends itself to certain types of work, but the realities of your job might dictate that you can’t just knock off at 3pm — for example, you’ve got meetings scheduled at 4pm, or perhaps you’re dealing with clients in another country and the time difference means working through to 9pm. However, having the flexibility to work your own hours, so long as outcomes are met, is something that this experiment is ultimately supposed to shift people’s mindset to. Everybody has their own preferred workstyle. However, everybody is working in a team, towards common objectives, so it’s a matter of aligning individual workstytles in a way that doesn’t compromise the team’s communication, collaboration and ultimately, its objectives. Having to track metrics on a week to week basis might border on micro-management, and it is something I’m doing purely for the experiment. Thereafter, it’s about having faith in your people not to abuse the system. For me, I hire people who I don’t need necessarily need to continuously motivate, people who are values aligned, who believe in what we’re trying to achieve and are capable of doing so, self-starters who enjoy getting into flow, learning and growing as individuals and taking pride in the team’s achievements. Such experiments won’t work if your people don’t espouse such values and instead want to do as little work as possible. 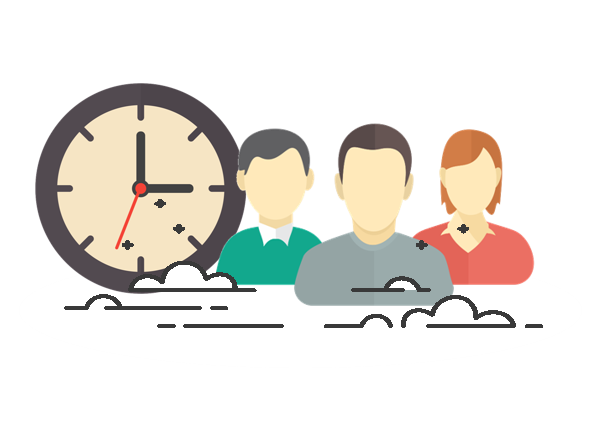 If your organisation is one in which people love having two-hour meetings with nine other people in the room because it means not actually doing any work, then a six-hour workday probably isn’t for you. 3pm is just a guideline, not a rule; in some cases, people opted to work until well passed this because they were immersed in an activity, felt they could give a little more or were working on something urgent. 7. A Week is Too Short. What you do one week might differ considerably from what you do the next, so running the experiment over a longer period of times makes sense. But only continue running it if you’re not seeing a marked drop-off in people’s productivity, morale and wellness. If you must work beyond 3pm and if you truly found yourself in flow for a good five hours that day and have stretched your cognitive capacity, then perhaps save rudimentary tasks for the end of the day. If you can get away with it, outsource such tasks. Finally, this experiment only works with motivated people that get into flow, are outcome focused and don’t normalise the 9 to 3 workday to the point that they treat it like a shorter version of a standard day, complete with long lunches and afternoon slumps; there’s no room for timewasting during a shorter work day! We’re going to continue running the experiment for at least another week. Incidentally, I wrote the 3,500 words of this article in little more than two hours whilst on a plane en route to Hong Kong, and in order to do that, I had to get to and stay in flow. If you’ve been contemplating the 9 to 5 work day and found this useful, or hated it, I’d love to hear from you. My forthcoming book, out January 2019.